A Bar/Bat Mitzvah, according to Jewish tradition, means to become a responsible adult in the community. What can be a more suitable location for this ceremony than in the land of our forefathers - the land of Israel. This is one of the most memorable occasions in the life of a Jewish person. We invite you to celebrate this important milestone in your life with your loved ones. Join with your family and friends in this spiritual experience in the land in which the Jewish past and present merge into an unforgettable reality. You are going to stand at the Western Wall, ascend Masada - the symbol of Jewish heroism and visit the vibrant cities and kibbutzim of modern Israel. 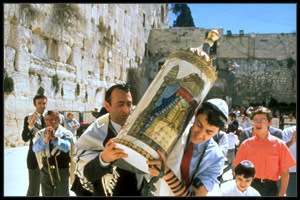 You will learn about the history, traditions and rich heritage of Israel and the Jewish people from our learned, experienced and friendly tour guides. You will enjoy the comfortable accommodations and you will be surprised by the richness of the famous Israeli breakfast. You will meet Israelis who came to live here from all corners of the world. Our land partner in Israel has a long and rich experience working with many Bar/Bat Mitzvah families from all over the world. They will have their representatives waiting for you at the airport and they will be with you from the first moment of your arrival in Israel. They will ensure that everything will go smoothly during the whole period of your journey. We are sure this tour will be an unforgettable experience of a lifetime for you and your family. You will always remember your coming of age in the land of the Bible. You will walk the streets and see the sites of the city that generations of Jews were only able to mention in their prayers. You are among the lucky ones for whom the thousands of years of praying and yearning for "Next year in Jerusalem" can and will become a reality. We look forward to seeing you in "Eretz Yisrael."